AKIPRESS.COM - Islamic State fighters shot and killed hundreds of residents in the Iraqi city of Mosul in the past two weeks, the United Nations said on Thursday, describing an increasingly desperate drive by the jihadists to prevent civilians from fleeing, NYT reported. Iraqi forces, backed by airstrikes from a United States-led coalition, have made advances into the city, and the Islamic State, also known as ISIS or ISIL, has responded in brutal fashion to halt the flight of civilians they want to use as human shields, the United Nations said. The deadliest attack came June 1, when at least 163 civilians, including women and children, were killed near a Pepsi factory as they headed out of the Shifa neighborhood of Mosul, the United Nations’ human rights office in Geneva said. “They were gunned down as they were fleeing,” said Ravina Shamdasani, a spokeswoman for the human rights office, which reported that, as of two days ago, the bodies of the victims were still lying in the streets. 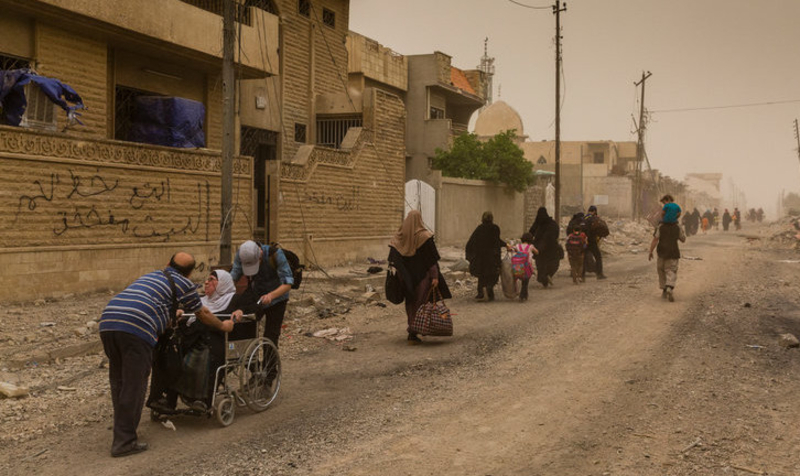 About 200,000 civilians were still trapped in desperate conditions in the old city of Mosul, targeted by jihadists and suffering heavy casualties from coalition bombing and artillery fire. Iraqi forces had been advising Mosul residents to stay in their houses because of the street-by-street fighting and aerial bombing, but government aircraft have dropped leaflets in recent days urging residents of the old city to flee. The United Nations reported that the Islamic State had shot and killed at least 231 civilians in the past two weeks, but Ms. Shamdasani said that many other people were missing and that the actual death toll was almost certainly higher. Fighters killed 27 civilians in the Shifa area last month. On Saturday, they shot 41 more in the same neighborhood as they tried to reach positions held by advancing Iraqi forces, Ms. Shamdasani said. Since Iraqi forces opened their campaign to retake western Mosul more than three months ago, the Islamic State has herded thousands of civilians into locations near the fighters’ positions to form a human shield.